Why Do Christians Act So Un-Christian? Some Christians can be rather unkind to others, including other Christians. 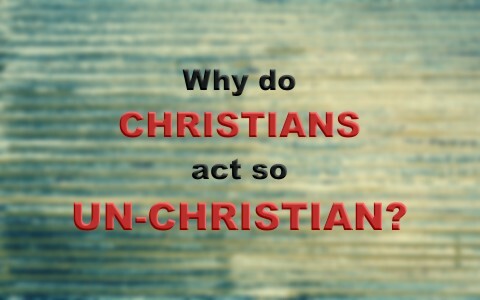 Why do some Christians act very un-Christian like? When Jesus was about to return to the Father, He told the disciples that He would not leave them as orphans (John 14:48), but would return again, and He would take them to be with Him where He is. So our calling is to glorify God and the Son of God, Jesus Christ, but we’re also called to be His witnesses and to make disciples of others, wherever we go (Matt 28:18-20). So what is one of the most overlooked ways to evangelize? I believe it is love. When we show love to those that hate us, it shows the world that Jesus teaches a radically different and supremely better way to live. Instead of hating those who hate us, Jesus calls us to love them, pray for them, and ask God’s blessing upon them (Matt 5:44; Luke 6:27-28). It’s a very difficult thing to love those who hate us, but we must remember, they don’t hate us so much as they hate the One Who we put our trust in. Since we’re called to love our enemies and do good to them that do bad things to us, how much more should we love our brothers and sisters in Christ…the very children of God Whom Jesus Christ lived and died for? He purchased them with His own blood, so to act unkind and unloving to those in the Body of Christ, is to do what we’re not even supposed to do to our enemies! Surely we recognize that Jesus died for us while we were still ungodly, wicked sinners, being enemies of God (Rom 5:6-10), so how can we ever justify treating our brothers and sisters in a way that the world treats their own? When Saul was struck down on the Damascus Road, Jesus didn’t ask Saul (later, Paul), “Why are you persecuting the church?” or “Why are you persecuting Christians?” Rather, Jesus said, “Saul, Saul, why are you persecuting me” (Acts 9:4)? When Paul was persecuting the church, he was actually persecuting Jesus, because the church is the Body of Christ, and that represents Jesus Himself! Clearly, what we do for others, we do for Christ (Matt 25:40), either good or bad. Here’s what I see the church being at times. The church is the Bride of Christ, and here she comes down the aisle, headed toward the marriage of the Lamb of God, Jesus Christ. As she heads down the aisle of time, we see that her sleeves are torn, she’s got a black eye, a teeth missing, her dress is soiled, and it looks like someone’s tried to pull her hair out. Then one of the angels says “Looks like the church has been fighting with herself again.” That’s the image the world often sees. They never bring up the positive things the church does, because it only takes one bad example to offset 100 good things, at least to unbelievers. When we act like the world, talk like the world, and react like the world, why would the world ever be interested in coming to Christ? They see us as no different from the rest of the world. It’s a sad indictment of which I am not guiltless, so when we are attacking other believers, no matter what it’s over, we are persecuting Jesus Christ! Of course we should contend for the faith once delivered (Jude 1:3), but that doesn’t mean we have to be contentious. Our brother and sister might take it personally, but Jesus really will! The Apostle Peter writes, “even if you should suffer for righteousness’ sake, you will be blessed. Have no fear of them, nor be troubled in your hearts honor Christ the Lord as holy, always being prepared to make a defense to anyone who asks you for a reason for the hope that is in you; yet do it with gentleness and respect” (1st Pet 3:14-15), so if we are to respond to our persecutors with “gentleness and respect,” how much more so should we treat our brothers and sisters in Christ?! I noticed that Jesus didn’t say that others will know we are His disciples by our miracle healings, our convincing arguments, or rationalization for the existence of God. Jesus said there is a way for all people to know who are, and those who aren’t His disciples, saying, “A new commandment I give to you, that you love one another: just as I have loved you, you also are to love one another. By this all people will know that you are my disciples, if you have love for one another” (John 13:34-45). It is “by this” that people will know if we’re Jesus’ disciples. Loving one another is a strong apologetic. It is more than pouring over the ten thousand plus manuscripts, the hundreds of thousands of archaeological digs, or C.S. Lewis’ Morality Argument for the Existence of God. It is love that convinces people we are His disciples. Love may win more converts than anything else, but of course we know it is God alone Who saves. He uses us as a means to save others, but it is the Spirit of God that quickens them (Eph 2:1-5), however, love is a powerful magnet that makes people look. When we love others like Christ loved us, willingly dying for us, others will know we are His disciples. They may not act upon that, but that’s not our responsibility. It is their response to His ability, but it is our responsibility to love others as Jesus loved us! One of my favorite Bible teachers is theologian Dr. R.C. Sproul (Ligonier Ministries), and he once said that “Doctrine divides,” but it’s supposed to. If someone is teaching error, they should be made aware of it. We must contend for the faith, so when we see imitations or false gospels, we have to speak up, but that doesn’t mean we should be unloving. Better that doctrine unites than divides, but if there are some who have disagreements over things like the millennium, the time of the rapture (or no rapture at all), the Anti-Christ, speaking in tongues, and other such things that are non-essential to salvation, then we are not loving others as Christ loved us. I hold to the pan-millennium view…it will all pan out in the end, but if we don’t have this “love for one another,” they may think we are not His disciples, but on the other hand, if we “have love for one another,” “all people will know that [we] are [His] disciples,” and that’s exactly what we want, isn’t it? Here is some related reading for you: How Do You Know They Are Christian? Previous post: What Are The Characteristics Of Good Service?